bid/no-bid decision methodology, bid/no-bid decision model, bid/no-bid decision software, bid/no-bid decision flowchart, bid/no-bid decision analysis tool, bid/no-bid decision assessment tool, bid/no-bid decision algorithm, bid/no-bid flowchart, bid/no-bid evaluation criteria, bid/no-bid assessment tool, bid/no-bid checklist, bid/no-bid analysis tool, bid/no-bid criteria list, formal bid/no-bid decision template, bid/no-bid decision tree analysis software, bid/no-bid decision tree program. Intelligence. What's the problem? (note: intelligence should be understood as information). Design. What are the potential solutions? Choice. What's the best solution? The bid/no-bid decision process aims at factoring risks and benefits in, which are both inherent to the bid/no-bid decision. The purpose of implementing such a bid/no-bid process is to make it reliable and repeatable as part of a more general process improvement initiative—driven for instance by the Business Development Capability Maturity Model (BD-CMM) [Shipley 2006]—to increase key performance indicators (KPI) like win rate (number of awards/number of submissions) and capture ratio (value of awards/value of submissions).
" What tools are available to help us make a good bid/no bid decisions?" Bid/No-bid Decision Checklist. This is the simplest form of all bid/no-bid decision tools. 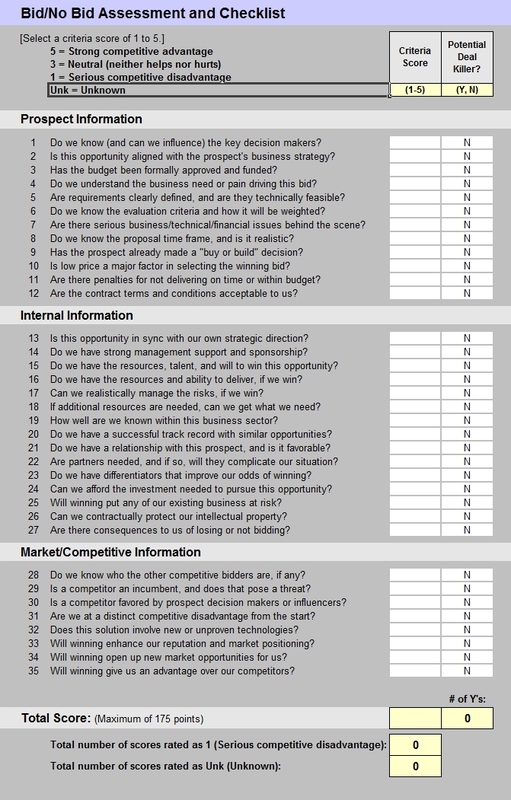 The bid/no-bid decision checklist is a mere set of questions. Also known as bid/no-bid form. Bid/No-bid Decision Matrix. A fancy version of bid/no-bid decision tools that assigns weights to questions, and computes a global score—the weighted average (WA). The bid/no-bid decision matrix then allows you to compared this score against the threshold deemed acceptable in order to bid. Also known as bid/no-bid grid. Bid/No-bid Decision Tree. The most elaborated format organizes the questions as a multi-branch logical flow leading to either a no-bid decision from several exit points within the process or the bid decision when all answers are positive. Usefulness: Is the opportunity strategic or aligned with the company strategy? Desirability: Does the company want to chase the opportunity? Capability: Does the company have the necessary resources? Viability: Is the opportunity worth bidding (value)? Risks: Can risks be mitigated? Are we the incumbent provider of the product or service being requested in this RFP? Is the customer happy with the incumbent's performance? If the customer is unhappy with the current vendor's performance, was the RFP issued to deal with those problems? Do we have a strong relationship with the customer? Does this RFP play into one of our strenghts? Does the RFP appear to be slanted toward a competitor? Is this project or acquisition funded? If not, are funds available within the client's budget? Is the client serious about making a decision, or is this more of an exercise in information gathering? Will completing this project or deliverable require heavy investments of time and money on our part? Would winning this contract further our own goals? Is this client likely to be a strong partner or reference account in the future? Would winning the opportunity be particularly damaging to our competitors? Are there strong political considerations affecting our decision to bid? Ok, you go through the questions, answer them. If you score 14 points, the decision is crystal clear. But then what do you do with 9 points, or only 7? What would be the ideal threshold to determine bidding is a wise decision? Are there answers more important than others? Lots of important questions that the bid/no-bid decision checklist doesn't answer. The bid/no-bid decision checklist asks the right questions, but answers are not leveraged properly. So it doesn't seem to be the best of the bid/no-bid decision tools. So what would you think about organizing questions as bid/no-bid criteria flanked with a weight within a bid/no-bid decision matrix? Questions are organized vertically as bid/no-bid criteria within the bid/no-bid decision matrix. A weight may be assigned to each questions in accordance with its relative importance in the final decision. Questions are then answered (rated) and the weighted average (WA) is computed as the product of the weight by the rating. Finally, a total score is computed as the sum of all weighted averages, and then compared to a minimum threshold to determine whether to bid or send a no-bid letter. The issue is that experts in the field of decision theory all agree that the weighted average method is not reliable in all the cases and that results should be challenged by more granular methods like "what-if" scenarios and sensitivity analysis, or any other method that analyzes deeper the coverage of questions by given answers. I'm talking here about Multi-attribute Decision Making (MCDM) should you be interested in investigating further. The bid/no-bid decision tree is the most advanced form of bid/no-bid decision tools. 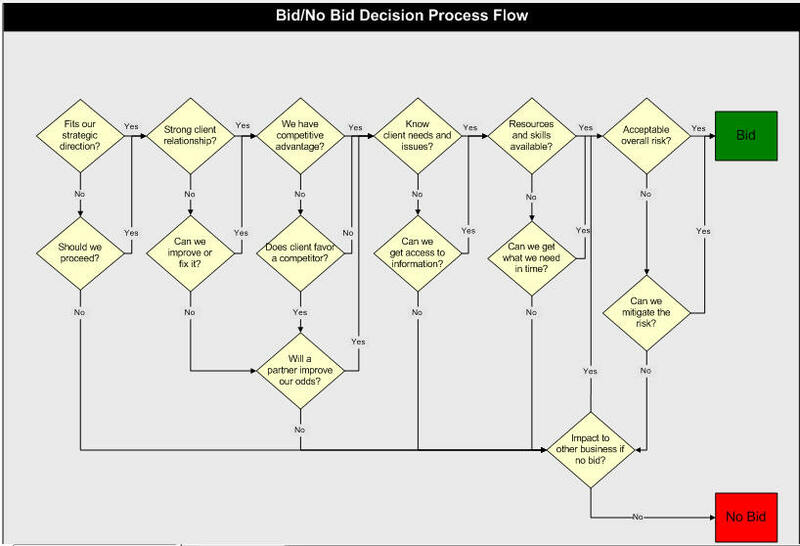 Represented as a bid/no-bid decision flowchart, it organizes the questions as a logical flow leading to either a no-bid decision from several exit points within the process or the bid decision when all answers are positive. Some would argue that all No's are given equal priority, but we see this as a more stringent way for contractors to be aware of and not to overlook risks should they answer questions otherwise than sincerely. In a participative environment, the bid/no-bid decision is shared and the process commented openly ensuring the whole team is motivated from the very beginning by the challenge of writing a brand new exiting business proposal in response to the IFB/RFP received. Final score: BIG WIN. But whenever a shortcut is taken, sometimes, against all odds, for political reasons or any other counter-productive reason, the bid/no-bid decision worksheet is kept secure in management drawer, spreading doubt to the masses, then wrecking havoc in the war room, and giving to disgusted team members a good excuse not to show up at all. Final score: NO WIN. Worth to mention that offerors that go beyond this step in the bid/no-bid decision process decrease significantly their chance to win because of a higher probability for their proposal to be deemed non-responsive. Except if they team up with a partner that can counter-balance their proposal weaknesses. Otherwise, the best strategy is actually to opt-out from the project instead of finding out too late—thanks to the post-award debriefing request letter you sent to understand the reasons why your bid/proposal was unsuccessful—that there was from the very beginning no way for you to win the contract. If you decide to bid because you' re afraid to say NO or to be removed from the bidders list for future opportunities, beware that damages could be even higher because there's a secret that allows to mitigate that risk successfully. Offerors should rather see and seize the opportunity to opt-out of the contract by making up their mind they would better send a well-written no-bid letter rather than submitting a weak proposal, thus appearing unprofessional to the solicitor's eyes. Indeed, if the only reason to decide to bid is because YOU WANT IT and you used forceps to reach the decision, then you'll be sad to know that your win probability is o%, niet, nada, rien du tout. The bid/no-bid decision process is your best ally, a garde-fou that, should you listen to it, will hamper you from taking what would be otherwise your worst decision ever—and being fired for it, period.